Check brake lining wear thickness (A). Check using a scale if necessary. Lining wear thickness (A) : Refer to BR-55, "Rear Drum Brake". Check surface of brake drum for uneven wear, cracks and serious damage. Replace it if necessary. Refer to BR-42, "Removal and Installation". Check inner diameter (B) of the brake drum using suitable tool. 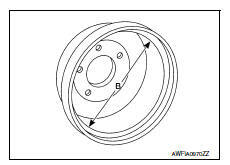 Brake drum inner diameter (B) : Refer to BR-55, "Rear Drum Brake".